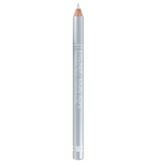 Thanks to its soft formula, this kajal pencil is very easy to apply. Contains Vitamin C and protects against free radicals. Did you know this pencil is available in a wide variety of colours? Produced in France.